The BC-720 offers all of the features and functions needed for superior diagnosis of body composition including muscle structure and abdominal obesity that lead to improved treatment for all body types. 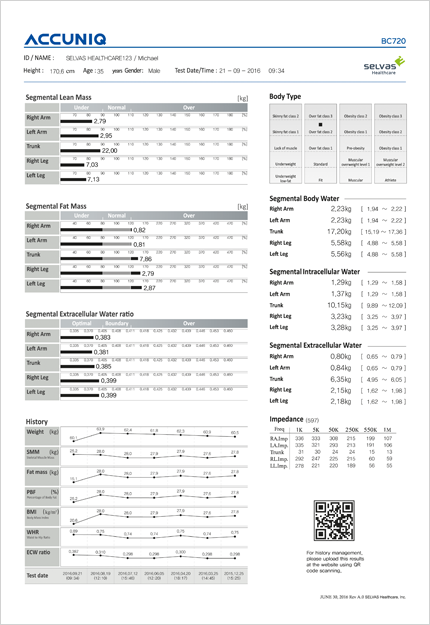 It shows the measurement results and normal range of body water, protein, minerals and body fat that make up our body. You can see the ratio of skeletal muscle and body fat that contribute to the body weight, by displaying the weight, skeletal muscle mass, and body fat mass graphically. 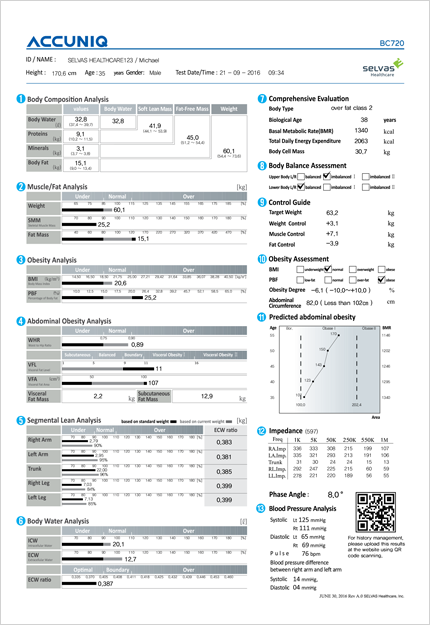 It shows the graphs of body mass index and body fat percentage, which are important items in the evaluation of obesity. The fat of the human body consists of subcutaneous fat and visceral fat. Evaluate various items about visceral fat that are closely related to adult diseases. Two graphs show muscle mass assessments of the five parts of the body (left arm, right arm, left leg, right leg, torso). We evaluate the intracellular water, extracellular water, and extracellular secretion. Body type determination, body age, basal metabolic rate, calories needed per day, and cell volume. It evaluates the left and right balance of the upper body of the human body and the balance of the lower body left and right. It evaluates whether the human body is balanced right or left rather than a lot of muscle or fat. Suggested adjustments for recommended weight, weight, muscle, and fat. B.M.I. and body fat percentage can be evaluated in low-level, standard, overweight, and obesity levels, and obesity and abdominal circumference can be identified. 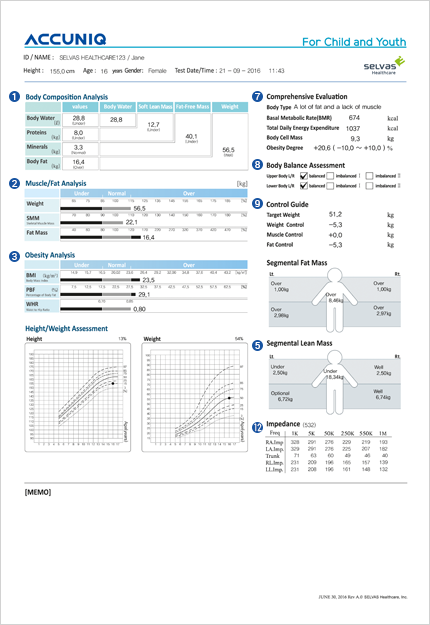 Based on the results of abdominal obesity analysis and body composition analysis of the subject, it is a chart to predict abdominal obesity as the age increases with the present abdominal obesity status. Indicates frequency and area specific impedance. Impedance is the resistance value that occurs when current is applied to the human body. Each impedance has a unique value. 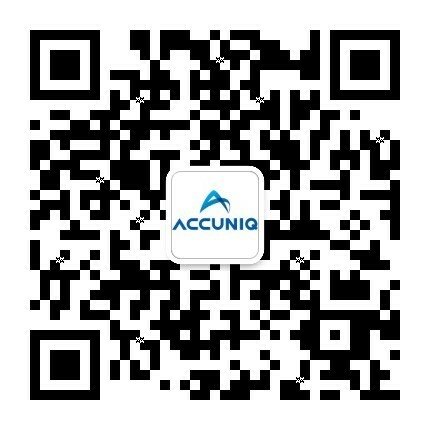 When connecting the sphygmomanometer provided by ACCUNIQ, the measured blood pressure data is displayed. Obesity and blood pressure can be evaluated at the same time, which is useful for diagnosis.